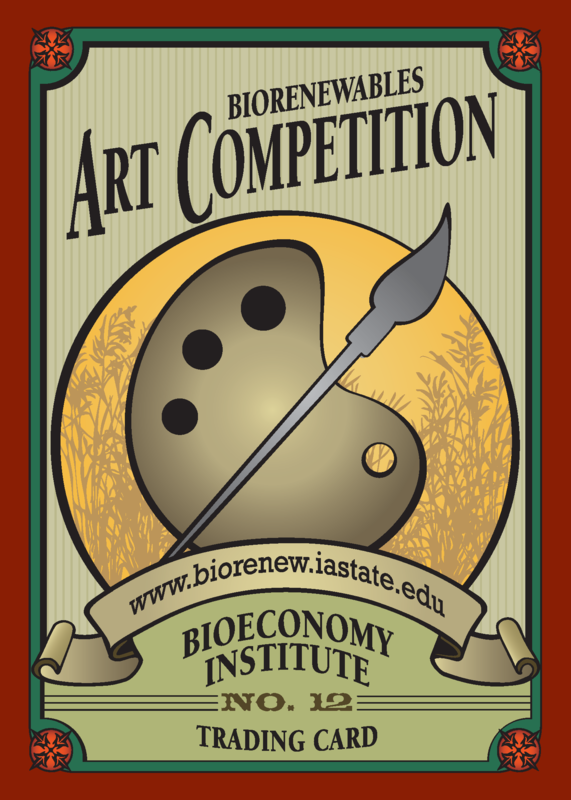 The Biorenewables Art Competition is an annual event for Iowa State students enrolled in art or design courses. The competition was the result of collaboration among Jill Euken of the Bioeconomy Institute and Ingrid Lilligren and Barb Walton, both professors in the Integrated Studio Arts program of the College of Design. The artwork and exhibit represents the collaborative nature of the building and the research being conducted at Iowa State University. Each year, jurors select works for the student art exhibit as well as award prizes for best in show, first place, second place, and third place. Each year, one entry is selected as Best in Show. This piece becomes a permanent part of the BRL art collection. The student art is displayed in the lobby and administrative suite of the BRL. Visitors are welcome to view the exhibit; it is open 8:00 a.m. to 5:00 a.m. (7:30 a.m. to 4:30 a.m. during breaks and the summer), Monday through Friday. The art exhibit is featured at most Biorenewables Research Laboratory (BRL) functions and tours, which include visitors from all corners of the United States and abroad. 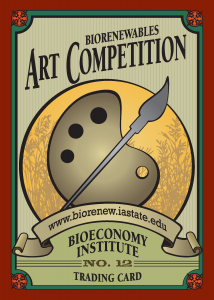 Special thanks to Dr. Robert C. Brown, the Director of the Bioeconomy Institute, for sponsoring student prizes. In addition to the student pieces, the BRL also features artwork from Iowa State University faculty members. These twelve paintings are the result of collaboration between artist, Barbara Walton, Associate Professor of College of Design, and scientist, Dr. Tong Wang, Professor of Food Science and Human Nutrition. Postdoctoral Research Associate, Hui Wang worked with Toni (Tong) and Barbara to make a soy wax that could be suitable as an alternative wax for use in encaustic painting. Encaustic painting is an ancient art form (approx. 500 A.D.), which traditionally utilizes beeswax and pigment. “Bean Series” is work that was created during the first phase of soy wax formulas made in this unique partnership. Special thanks to Professor, Lawrence Johnson, the Director of the Center for Crops Utilization Research and the BioCentury Research Farm. Professors in the College of Art and Design were given a bag of biochar, a product that results when biomass is converted into bio-oil with pyrolysis, with which to create charcoal image.